Golf is one of the most popular pastimes/sports/hobbies in the United States. Amazingly, twenty-nine million Americans participate in golf. But what happens when a person’s disability, their loss of stamina or reduced immobility, prevents them from enjoying the game of golf? The answer: The Solo Rider golf cart. The cart has, for over a decade, helped golfers who suffer the kind of disability that could prevent them from playing, to get out on the course comfortably. The golf cart has a unique design that can handle the various terrain of a golf course, but also, because the cart can move across the course with ample speed, the golfer can both be supported and comfortable and keep to a similar pace of play as he or she once had. The Solo Rider golf cart is capable on both tees and greens; it can handle even the steep terrain of golf courses built on mountains. The cart can be operated with single handed controls, and the seat enables an easy entry and exit. When the seat swivels to allow a golfer access outside the cart, it then supports the golfer in an elevated hitting position. It’s amazing to think how many golfers are able to participate in the game they love because the technology of the Solo Rider golf cart has made it possible. And it’s not just seniors who benefit from the Solo Rider golf cart, but also those people who struggle with balance and stamina; any golfer who has mobility impairments. And it’s not just golfers: anyone who participate in outdoor recreational activities can use the Solo Rider to keep participating in the activities they love. Imagine touring the banks of a lake for a spot to fish, then stopping on the shore at a particularly attractive looking bay and having the Solo Rider support the fisherman as he makes a cast, nets a fish, etc. 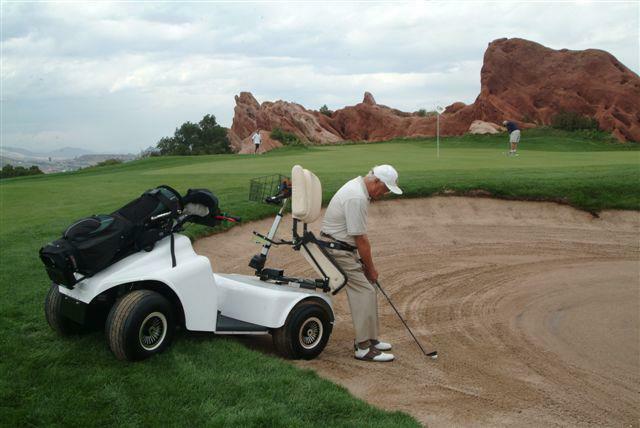 If you have any questions as to how technology such as the Solo Rider golf cart can help you or someone you care about to participate in the activities they love, then call G and J Enterprises today.